I have personally supervised over 15,000 one-on-one appointments and I will do so for each one of your high intensity workouts. Get the results you need and want in a fraction of the time with the most efficient, effective and safe exercise protocol there is. One twenty minute workout a week (or in specific circumstances for certain individuals two twenty minute workouts a week) is all you need to optimize your physical fitness. Watch Simon instruct a leg press exercise. Watch Simon instruct a pulldown exercise. If after 6 appointments, you don’t feel you have seen improvements I will give you your money back. 20 to 40 minutes of targeted exercise per week provides the greatest benefits possible from focused exercise in terms of health, fitness, strength and body shape optimisation. HIT is scientifically applied exercise that tracks muscle and joint function, optimally stimulating the musculature, metabolism and cardiovascular systems. We will use the HITGYM AIO by David Health Solutions, a leading innovator of resistance training and medical fitness equipment based on scientific research. Private appointments are pre-booked only, you will have my complete attention throughout your appointment, and there will be no other trainees present. Focused observation, coaching and feedback through every repetition of every exercise you perform in every workout with ongoing tracking of your progress. 20 to 40 minutes of targeted exercise per week provides the greatest benefits possible from focused exercise in terms of health, fitness, strength and body shape optimisation. This gives you more time to enjoy your family, friends, business and social life, hobbies and relaxation time. HIT is scientifically applied exercise that tracks muscle and joint function, optimally stimulating the musculature, metabolism and cardiovascular systems. Provided in the correct dose and frequency HIT will outperform other exercise modalities. We want to apply the exact stimulus for the required response, no more and no less. Bone loss prevention; low force high intensity training is the best way to keep your bones strong and healthy and to prevent de-mineralization, osteoporosis and osteopenia. 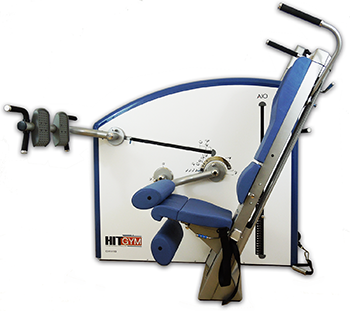 We will use the HITGYM AIO from David Health Solutions, a leading innovator in resistance training and medical fitness equipment based on scientific research. The HITGYM AIO outperforms other equipment in both user experience and long-term fitness results by incorporating the most advanced movement mechanisms available today. These mechanisms allow for smooth, low friction and biomechanically correct movement patterns. The HITGYM AIO makes it possible to train all muscle groups via 25 specific exercises (5-8 of which are selected for each individual workout) without compromising in training efficiency or user comfort. It includes special exercises for a healthier and stronger back using methods from the highly effective David Spine Concept, and the famous David cam profiles for rotational movements that match the strength curves of your body. The HITGYM AIO enables us to perform high intensity yet low force exercise and get the most out of HIT training, safely and efficiently. No mirrors, no loud music, or other distractions. You will get the most out of HIT and the best physical results your physiology is capable of with this level of attention.